Back in November 2017, Facebook came under fire for the unregulated availability to purchase prescription opioids on the social media site, just three weeks after President Trump declared the opioid crisis a Public Health Emergency. 6 months later creator Mark Zuckerberg would have to answer for site’s lack of oversight to Congress. “Anyone can report content to us if they think it violates our standards. People can flag Pages, profiles, individual content, and/or comments to us for review. Which left lawmakers shocked at the lack of oversight from the multi-billion-dollar company. Essentially, Facebook was suggesting that it relies on users to report the postings, rather than Facebook devoting employees to specifically police the site with the single task in mind. It’s not hard to find these prescriptions on the social media site, simply searching in the marketplace with the various names of opioids following with “for sale” will populate illegal prescription sales within miles of the user. 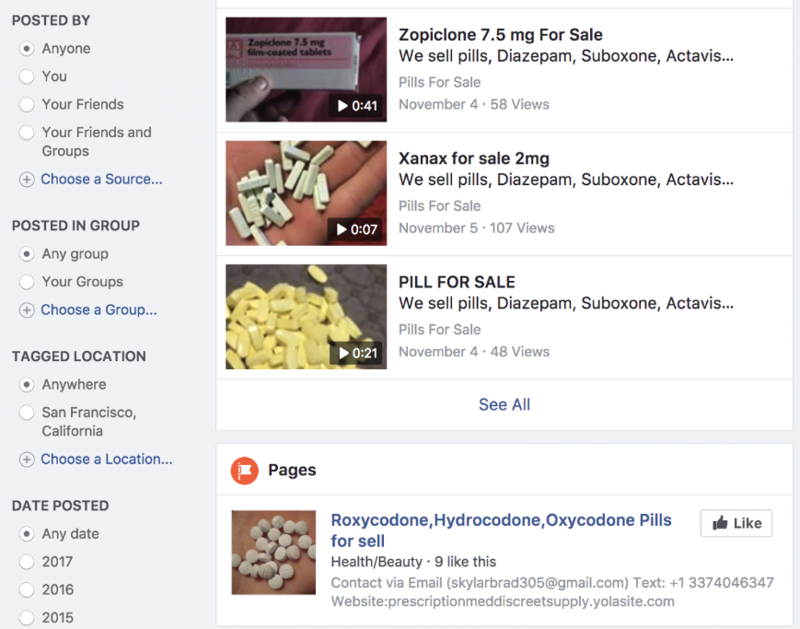 On November 13, 2017 CNBC searched Facebook for “Roxycodone, Hydrocodone, oxycodone pills for sale” and screen shots of the results showed ads that had been up since September that same year. Later during an Earning’s call, Facebook said it would hire up to 20,000 people for “safety and security”, including oversight for fake news and other restricted content. At the most recent Congress hearing, Zuckerberg sat wide eyed and awkward while accounting for his company’s failings, repeatedly apologizing for the lack of oversight on the massive platform and answering questions with non-responses and vague details of future intentions of restructuring of the site. Rep. David McKinley, a Republican representing West Virginia, was one of those members of Congress who pressed Zuckerberg on why Facebook hasn’t done more to remove posts from sellers offering illicit opioids. Zuckerbergs response was a weak indirect answer to McKinley’s question, by acknowledging how his company needs to build more artificial intelligence tools. Again, mentioning that the company predominantly depend on its security and content reviewers to take down posts that are flagged by users. He repeated his plans to hire 20,000 more employees to fill those roles by the end of the 2018. Annoyed members also brought up the opioid crisis, an epidemic that plagues many of their districts. “Don’t wait for someone to flag it. Look for it!” urged Kevin Cramer of North Dakota. CARTER: “Absolutely. I ask you this because some of the other members have mentioned about the ads for fentanyl and other illicit drugs that are on the internet and where you can buy them and your responsibility to monitor that and make sure that not happening. I had the opportunity this past week to speak at the Prescription Drug Abuse and Heroin Summit in Atlanta that Rep. Hal Rogers started some years ago. Also, we had the FDA commissioner there and he mentioned the fact that he’s gonna be meeting with CEO of internet companies to discuss this problem. “We didn’t take a broad enough view of our responsibility, and that was a big mistake. It was my mistake, and I’m sorry. I started Facebook, I run it, and I’m responsible for what happens here.” Zuckerberg apologized, while he took responsibility for something he never saw happening when he created the massively popular site. Zuckerberg has been flexing the apologies playbook since 2010, when Facebook was challenged by the Federal Trade Commission over privacy standards, and the most recent Cambridge Analytica scandal has shown just how little has changed within Facebook since then.